​Alongside the weaving kits that I sell, I also teach occasional workshops in weaving, showing small groups of people how to use simple weaving tools and techniques to make beautiful and practical things for themselves and their homes. All of my workshops are suitable for anyone with an interest in fibre crafts and no previous experience in weaving is required. So whether you are a complete beginner or have have done a little bit of weaving sometime in the past and would like a refresher, come along and learn some new skills and be inspired. "Had a really enjoyable day Caroline. Learnt soooooo much. " "Totally hooked now on peg weaving and am going to buy one for myself as I can see endless possibilities of things to do with it." "Your workshops always feel so Zen!" "I can't praise Caroline enough for the amount of knowledge and patience she has and is willing to share with whoever asks." I currently teach with The Contemporary Craft Collective or at my home studio. I can also come to you if you are a small group - just email me. In April and October each year I can also be found teaching workshops at www.craft4crafters.co.uk at the Bath and West Showground. 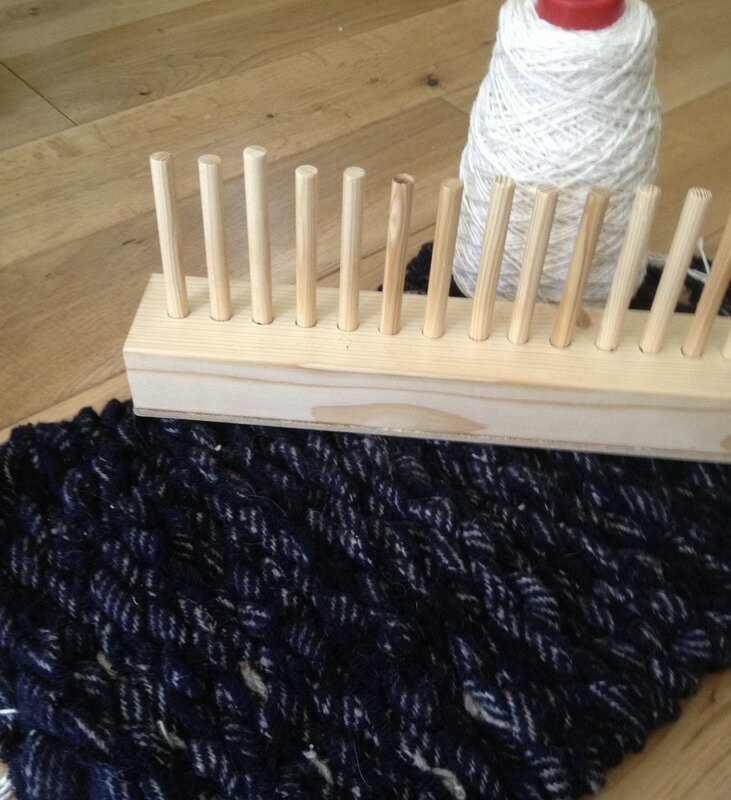 Using a simple wooden peg loom to show off the beautiful textures of natural materials, you will learn to warp the loom and then weave a thick and cosy rug - perfect for your bedside, bathroom or your lounge. Peg loom rugs work really well in lots of different materials - use old sheets to make cosy washable fabric rugs for the bathroom or use wool selvedge fabric or wool roving to make a thick and warm woollen rug. Bring your own materials (old sheets, chunky rug yarns if you have lots…) or buy some on the day. This is a half day workshop. This fun workshop will introduce you a new way of weaving - in a circle! Using just a simple cardboard (or pizza base) loom, you can weave a small wall-hanging, a coaster or a bowl - we will all start with the same basic tools and techniques but I will show you how to add a variety of materials, different techniques and shaping to make your weaving uniquely yours. I teach weaving using simple, inexpensive tools so it’s easy to learn and accessible to everyone. No previous experience necessary - I supply all the materials and the techniques, you just bring your creativity and a willingness to experiment and play! ​This is a half day workshop. This workshop can be done in one day but is best done as 2 half day workshops. 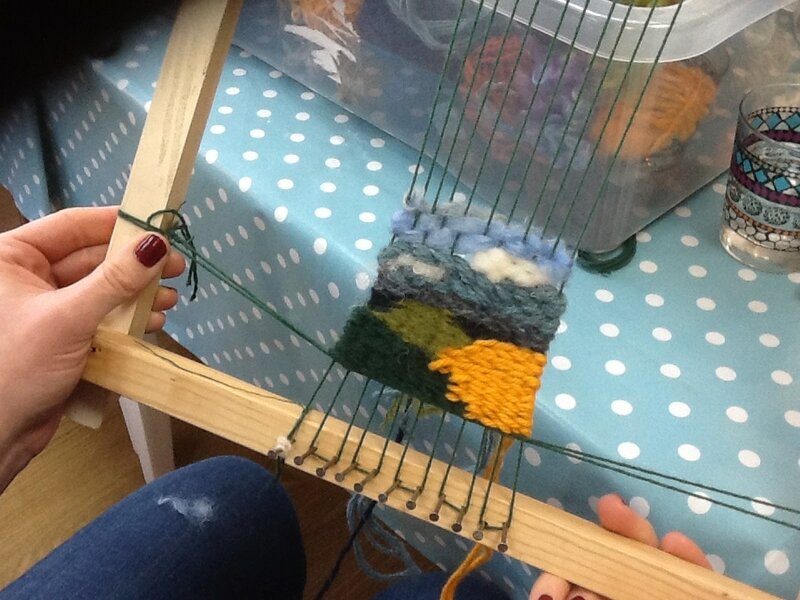 In this workshop you will learn how to warp the loom with suitable wool or cotton yarn and then weave a picture or abstract wall hanging using a variety of wool and other yarns. We will cover a range of different weft weaving techniques including plain weave, twining, making shapes, clasped weft and soumak and you will quickly learn how just a few techniques can make a really interesting and beautiful piece of work that is uniquely yours. During the workshop, we will also talk about how to embellish the weaving using stitch or applique, how to use different warp and weft materials and how to finish the weaving ready for hanging on the wall or framing. The workshop will also cover how to make a loom using either old picture frames or cut lengths of timber. If you’d like to take your loom home to keep weaving, they will be available to buy for a minimal price or charity donation. 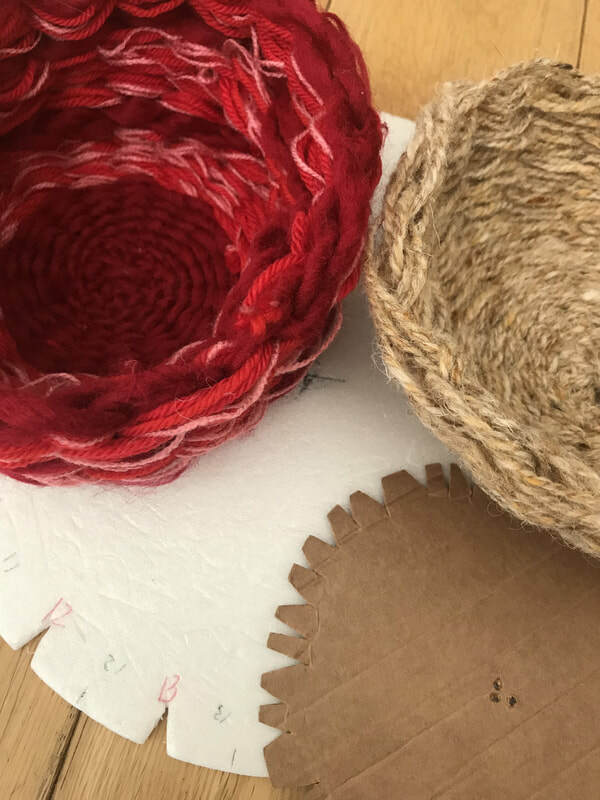 In this half day or evening workshop you will learn how to warp the peg loom and weaving sticks with suitable wool or cotton yarn and then weave a chunky round bowl using multiple strands of wool or other yarns. 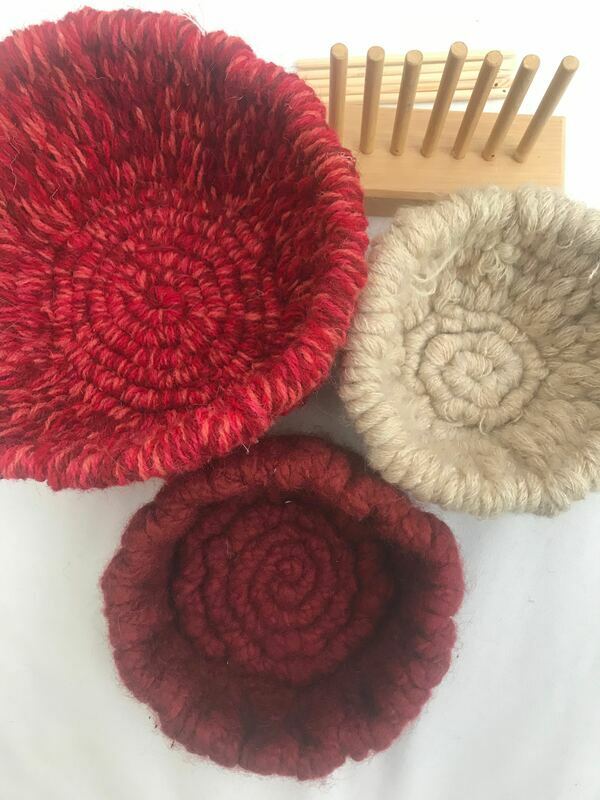 During the workshop, we will also talk about how to make different shape bowls, finishing techniques, using different warp and weft materials and how to embellish the bowl. You will also learn how to use the same techniques to make rugs, scarves and wall hangings and how to prepare a wide variety of materials for weaving, including sheep fleece and recycled fabrics. All materials are provided for the workshop, though you will need a tapestry wool needle (a sewing needle with a large eye) to finish off the bowl at home. For students who have already done a yarn bowl or rug weaving workshop on a peg loom with me or some basic peg loom weaving elsewhere. In this workshop we will go further with a peg loom and experiment with creating patterns and textures. We will cover plain weave, pick and pick, making shapes, soumak and rya knots - techniques that you would usually associate with tapestry weaving but are actually equally suited for the peg loom! All materials are provided. You will take home a weaving sampler will all the techniques you have learnt and also a handout to help you continue weaving at home. 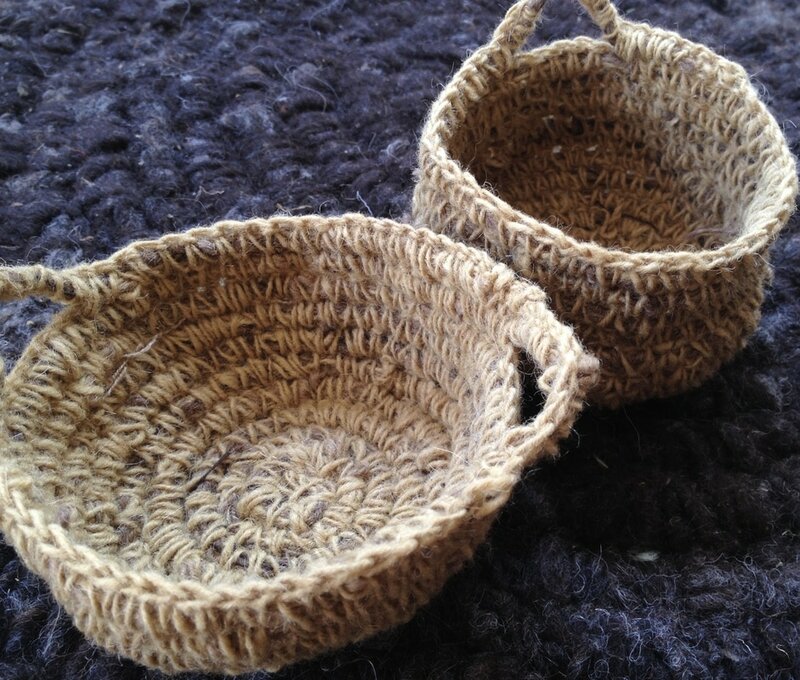 Come and spend a relaxing couple of hours making a circular rug or bowl. Choose whatever material you like - from recycled fabrics, wool selvedge fabric and chunky rug yarns - and choose how big you want to make it. I will bring lots of materials and you just pay for what you use on the day. As a guide, rug yarns for a bowl and recycled fabric for a rug can cost just a few pounds, while wool selvedge fabric for a larger rug could cost £20 - the technique is the same regardless of material so just choose whatever you fancy and is within your budget. If you have materials at home already that you think will be suitable and would like to bring, please feel free to. You will also need a crochet hook - again, you are welcome to use one of mine at the workshop or do bring your own if you prefer (any medium sort of size hook is fine, an exact size is not important). I will also bring some examples of my own work and show you how you can use the same technique to make bowls, perfect for storing bathroom toiletries, your knitting or all kinds of bits and bobs. This is another half day workshop.